Following her previous outing, Rachel Brosnahan along with her 'The Marvelous Mrs. Maisel' cast stopped by the Empire State Building on yesterday(November 27th) in New York to light the building pink. 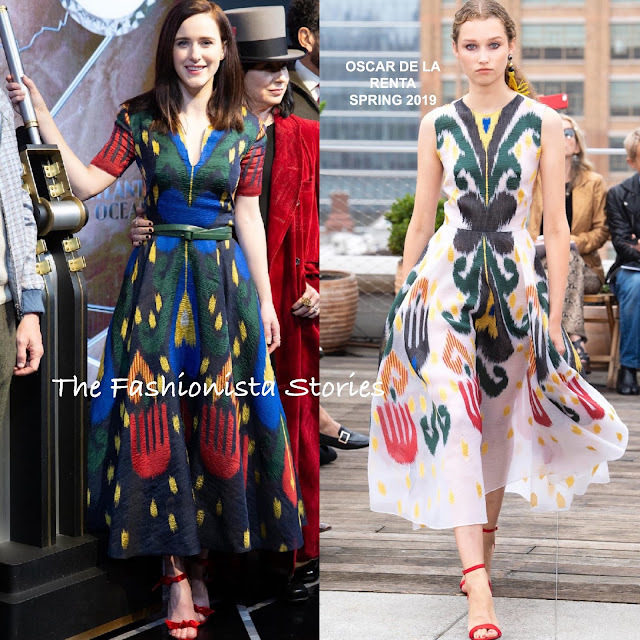 Turning to what seems to be one of her favorite fashion brands, she wore a OSCAR DE LA RENTA SPRING 2019 navy hazy printed, three-quarter sleeve dress, which stopped just above her ankles and also featured a belted waist. Her dress was shown in a white sleeveless version on the runway but Rachel's hue was season appropriate and perfect for the occasion. ALEXANDRE BIRMAN red bow sandals finished up her great look.